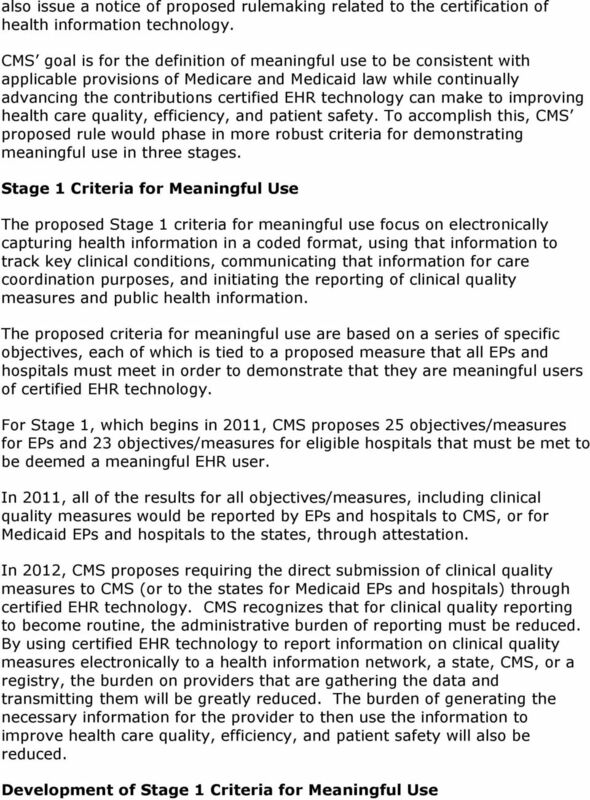 Download "Details for: CMS PROPOSES DEFINITION OF MEANINGFUL USE OF CERTIFIED ELECTRONIC HEALTH RECORDS (EHR) TECHNOLOGY. Wednesday, December 30, 2009"
6 of $15,000; $12,000; $8,000; $4000; and $2,000, respectively. For early adopters whose first payment year is 2011 or 2012, the maximum payment is $18,000 in the first year. There will be no payments for meaningful EHR use after There would be no payments to EPs who first become meaningful EHR users in 2015 or thereafter. For EPs who predominantly furnish services in a health professional shortage area (HPSA), incentive payments would be increased by 10 percent. Payment Adjustments o The Medicare fee schedule amount for professional services provided by an EP who was not a meaningful EHR user for the year would be reduced by 1 percent in 2015, by 2 percent in 2016, by 3 percent for 2017 and by between 3 to 5 percent in subsequent years. o For 2018 and thereafter, if the Secretary finds that the proportion of EPs who are meaningful EHR users is less than 75 percent, then the reductions will be increased by 1 percentage point each year, but by not more than 5 percent overall. 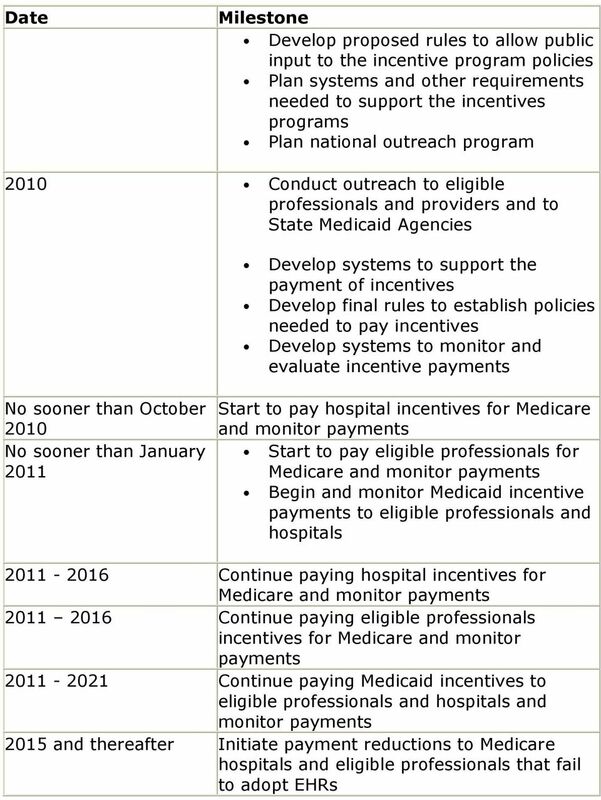 Medicare Payment Incentives for Hospitals Incentive payments are provided, beginning with October 2010, for eligible subsection (d) hospitals and critical access hospitals (CAHs) that are meaningful EHR users. 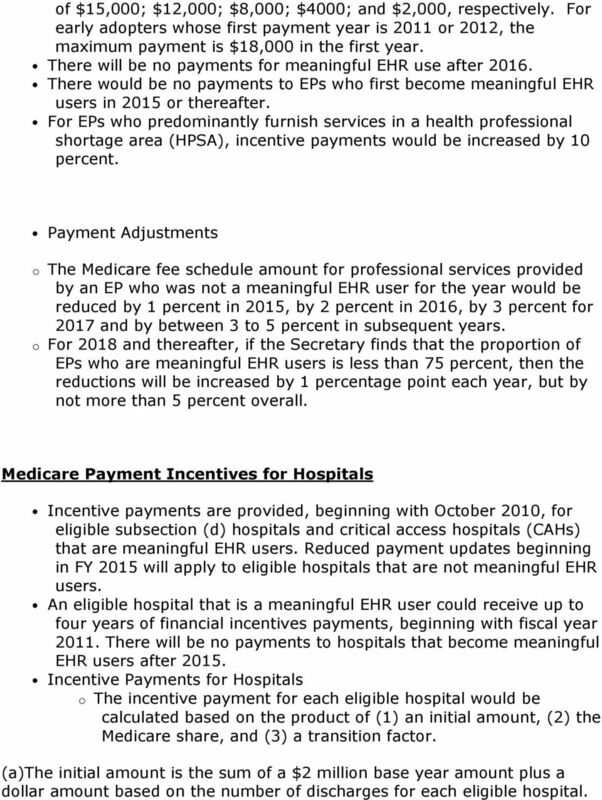 Reduced payment updates beginning in FY 2015 will apply to eligible hospitals that are not meaningful EHR users. 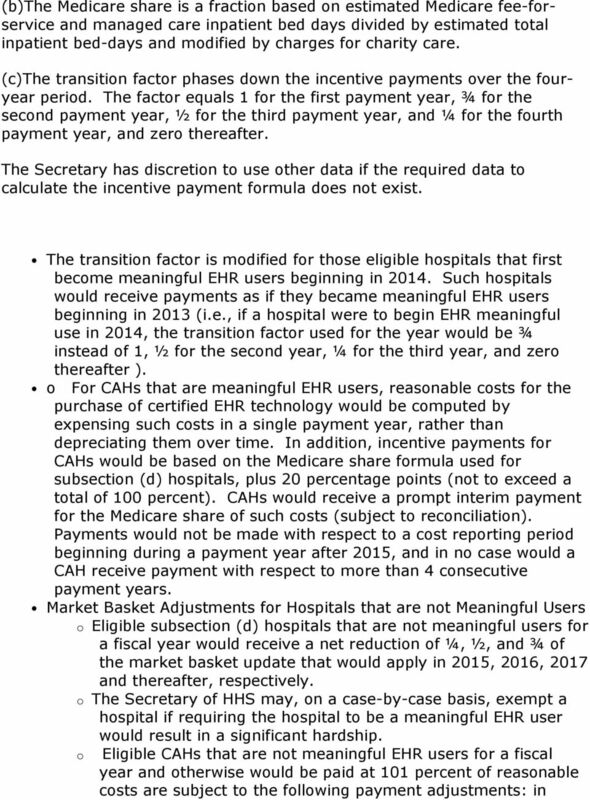 An eligible hospital that is a meaningful EHR user could receive up to four years of financial incentives payments, beginning with fiscal year There will be no payments to hospitals that become meaningful EHR users after Incentive Payments for Hospitals o The incentive payment for each eligible hospital would be calculated based on the product of (1) an initial amount, (2) the Medicare share, and (3) a transition factor. (a)the initial amount is the sum of a $2 million base year amount plus a dollar amount based on the number of discharges for each eligible hospital. 11 Question: When will the Centers for Medicare & Medicaid Services (CMS) begin to pay incentives to eligible professionals and hospitals for using certified Electronic Health Records ( EHRs)? 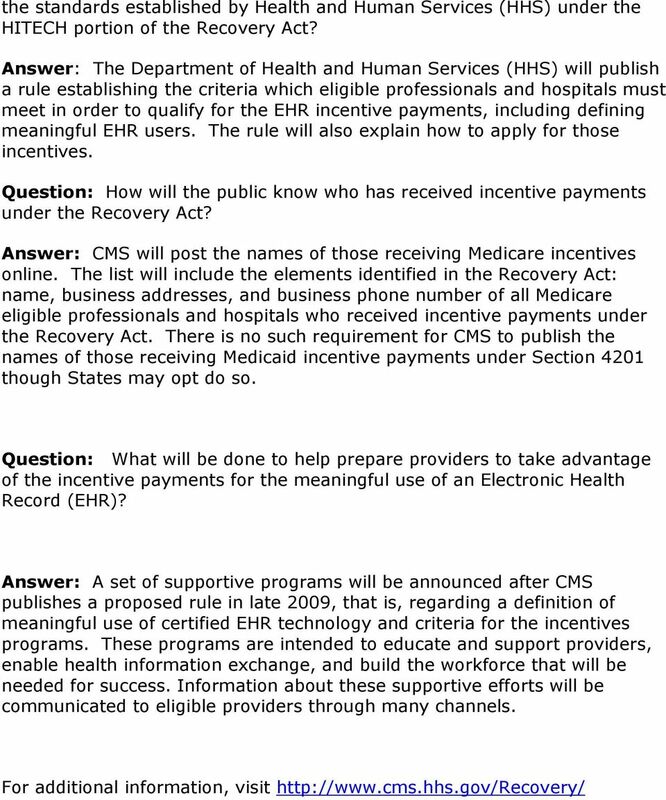 Answer: By statute, the earliest dates that CMS will be able to pay an incentive under Medicare is October 1, 2010, for hospitals and January 1, 2011, for eligible professionals. The statute does not define a date for the Medicaid incentives program. 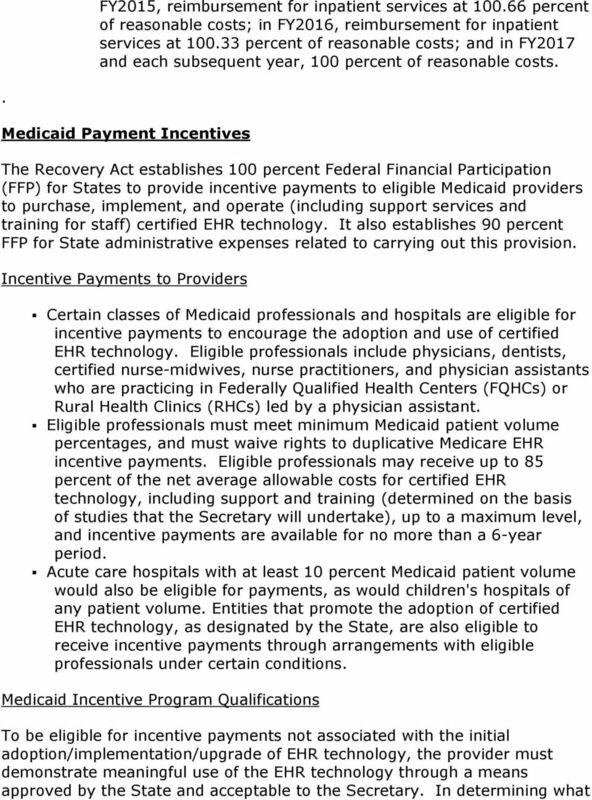 Given the range of regulatory and planning activities that must precede States being able to make provider incentive payments, as well as the importance of coordinating Medicaid and Medicare payments to prevent duplication, CMS does not expect that States will be able to make such payments until Work is underway to define the meaningful EHR user criteria, as well as the requirements for applying for and receiving the EHR payment incentives, CMS expects to issue a proposed rule in late Question: If an eligible professional uses a certified Electronic Health Record (EHR) in a meaningful way in accordance with the adopted regulations, and meets the requirements established by CMS, could that professional receive both the Medicare EHR payment incentive as well as the Medicaid EHR payment incentive? 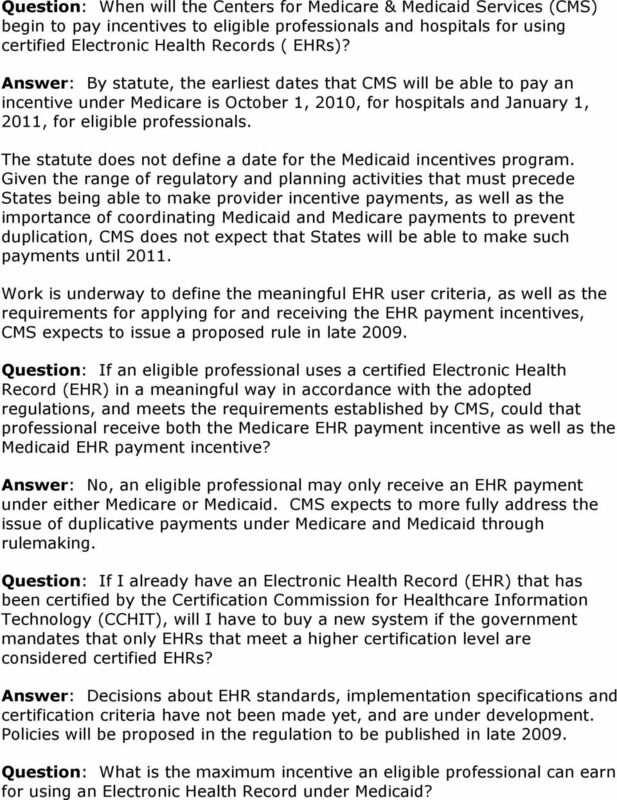 Answer: No, an eligible professional may only receive an EHR payment under either Medicare or Medicaid. CMS expects to more fully address the issue of duplicative payments under Medicare and Medicaid through rulemaking. 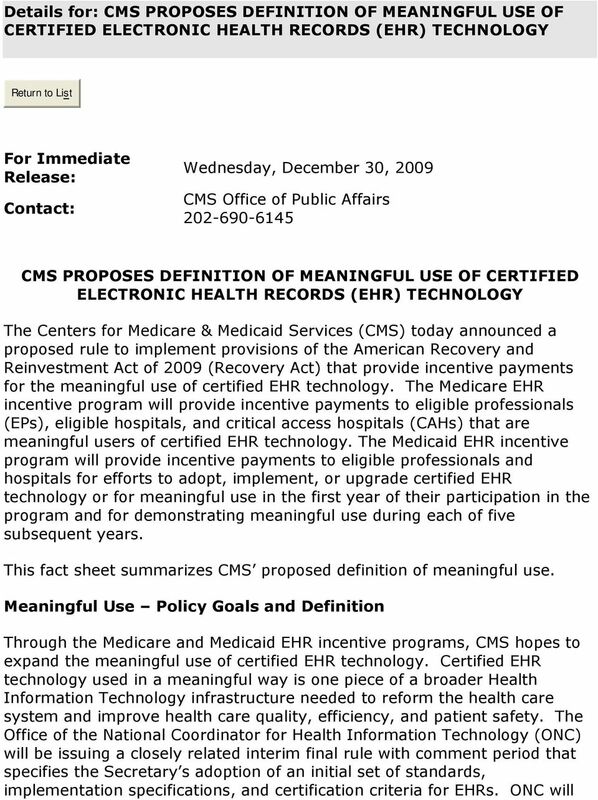 Question: If I already have an Electronic Health Record (EHR) that has been certified by the Certification Commission for Healthcare Information Technology (CCHIT), will I have to buy a new system if the government mandates that only EHRs that meet a higher certification level are considered certified EHRs? 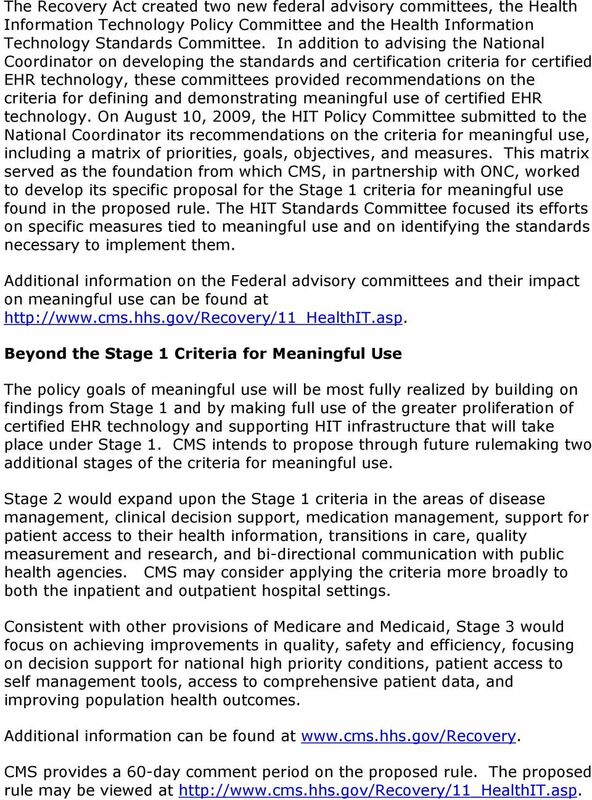 Answer: Decisions about EHR standards, implementation specifications and certification criteria have not been made yet, and are under development. Policies will be proposed in the regulation to be published in late Question: What is the maximum incentive an eligible professional can earn for using an Electronic Health Record under Medicaid? 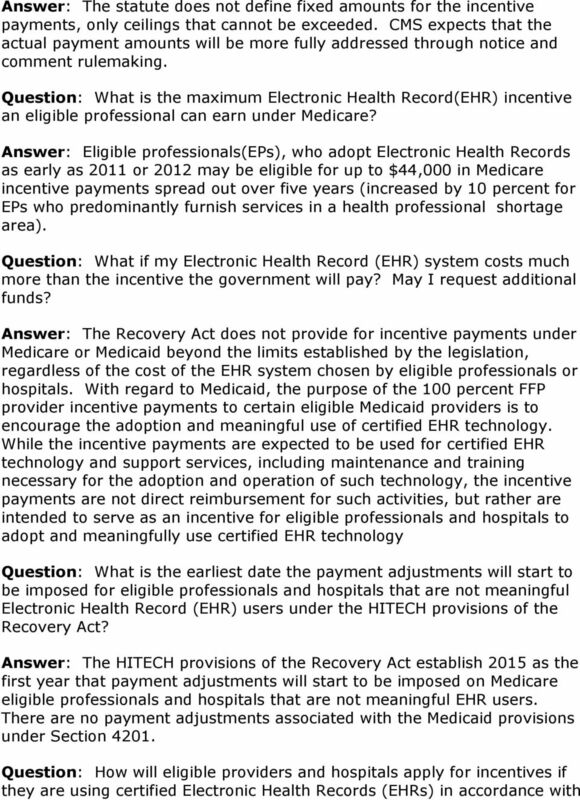 Medicare EHR Incentive Program - Tip Sheet for Critical Access Hospital (CAH) Payments Last Updated: September, 2012. Overview. 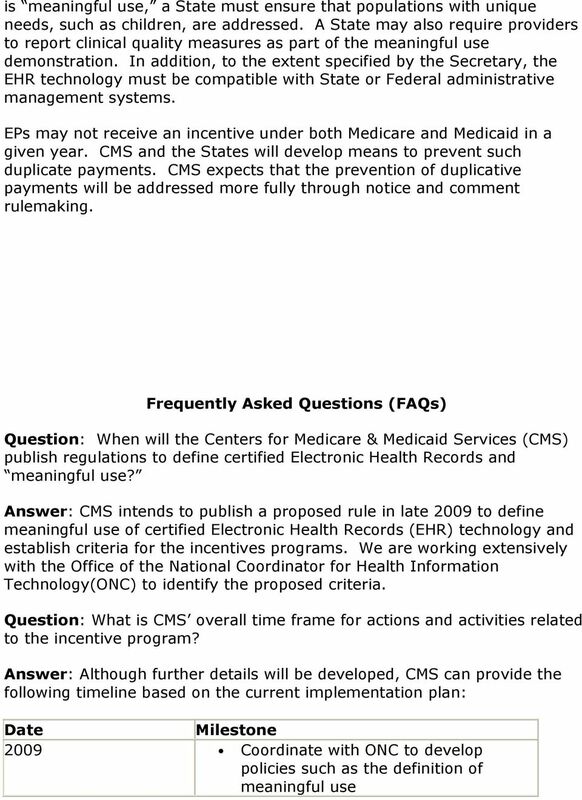 9808 9809 Can eligible professionals (EPs) receive electronic health record (EHR) incentive payments from both the Medicare and Medicaid programs? 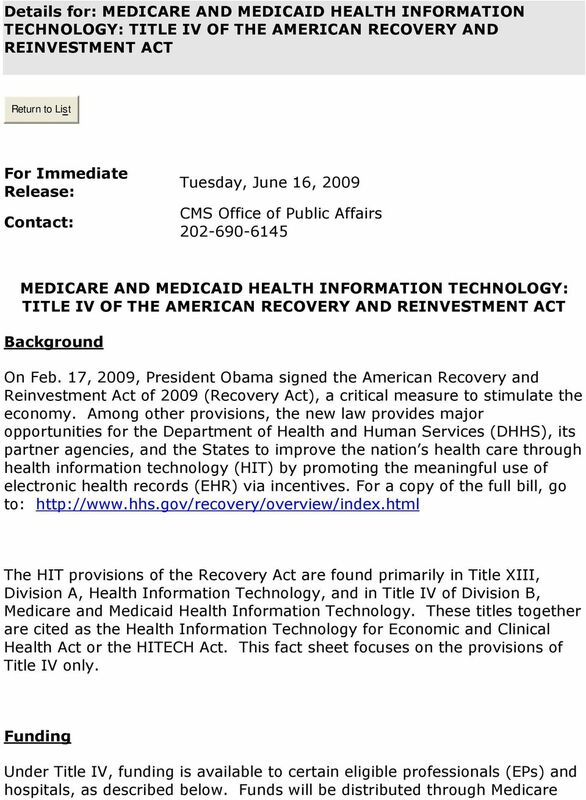 My electronic health record (EHR) system is CCHIT certified. Health Law Alert. 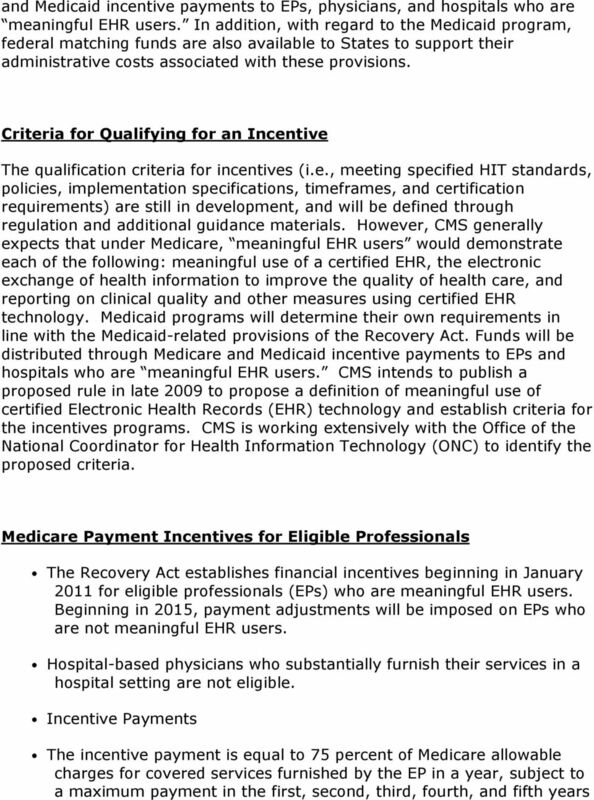 The Medicare and Medicaid EHR Incentive Programs: What You Need To Know. Health Law Practice Group: I.
MEDICAID EHR INCENTIVES PROGRAM Frequently Asked Questions (FAQs) For Eligible Professionals These FAQs have been developed for Eligible Professionals participating in the Medicaid EHR Incentives Program.